You are here: Home / Style & Lifestyle / Body & Mind / What about those e-cigarettes? I was certainly celebrating on New Year’s Eve this year, and not just to welcome in the New Year for the usual reasons. Finally, finally, Luxembourg has caught up with much of the rest of Europe. From the 1st January, we will be able to go to a bar for a drink without coming out smelling like an old ashtray. But I am sure not everyone is celebrating, and for the smokers amongst you, the smoking ban may be rather unpopular. But despair not; you don’t have to stand outside in the cold and rain frantically getting your nicotine hit. Well the most obvious is to pack in the smoking. This is the most powerful health intervention that anyone can make in their lives. There must be hours worth of reading on the subject available on the internet, so I am not going to talk about that today, except to say that if you are a heavy smoker, you are far more likely to succeed with medical help, so talk to your doctor about it. There is lots of interest and discussion everywhere about e-cigarettes at the moment and I noticed that there was a whole stall at the Christmas market devoted to selling them. An e-cigarette delivers a vapour that may or may not contain nicotine (the addictive component of a normal cigarette.) It may be shaped like a normal cigarette, so called “cig-a-likes”, but can also look completely different. It may have a rechargeable battery and the liquid that goes inside, known as “e-liquid” or “e-juice”, is sold in a bottle or cartridges, so that you can refill. The e-cigarette industry is big business with some of the big tobacco companies seeing the future and moving in on the act. Sales were predicted to double to more than one billion US dollars in 2013, and as e-cigarettes are currently cheaper to smoke than conventional cigarettes, and marketed as healthier, they are cornering an increasing share of the tobacco market. In New York and other US cities, “vaporiums”, or e-cigarette lounges are opening, where you can sample more than 90 flavours of nicotine infused vapours ranging from bacon to bubble gum. Up until recently, e-cigarettes had been fairly unregulated. There has been much debate as to whether they should be regulated as a medical device, but EU countries recently voted that they should be regulated as tobacco products. Former Mayor Bloomberg of New York banned the smoking of e-cigarettes in public places. Denmark considers e-cigarettes that contain nicotine a medical device, and as they have not been approved, they cannot be marketed or sold in Denmark. But are they safer? Are they a valuable aid to quitting? There is some evidence that e-cigarettes are safer than normal cigarettes and can help with quitting. However, when compared with the sort of trials that conventional nicotine replacement products have to go through (such as gum, patches or the nicotine inhalator) the data is fairly lacking. Studies have demonstrated harmful chemicals in some e-cigarettes, and the nicotine content labelling on the cartridges has been shown to be unreliable. 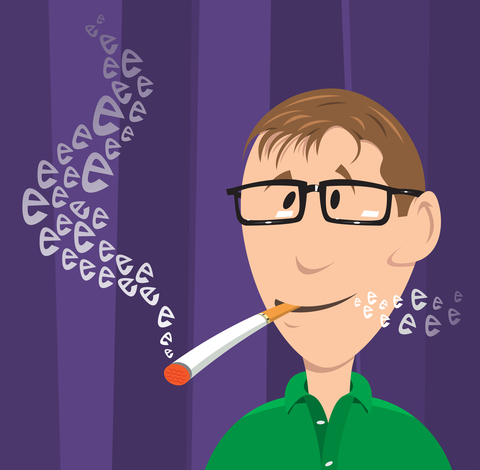 One of the hardest things about stopping smoking, for many people, is knowing what to do with your hands when you would normally be holding a cigarette. A nicotine inhalator might help in this situation, but there are no doubt many would-be quitters for whom conventional approaches have failed. The marketing around e-cigarettes makes them seem cooler than anything that a doctor might be able to give you, so some smokers may prefer to reduce their smoking by using these products. However the big concern is that despite the industry’s denials, marketing is also being aimed at young people and first time users. By glamourizing smoking, and making it seem healthier and more normal, e-cigarettes could potentially introduce more young people to smoking and nicotine addiction.